All year I look forward to Summer in the garden! Don’t get me wrong I love any time of year that I can pull home-grown veggies from my back yard but summer tops all of the other growing seasons! 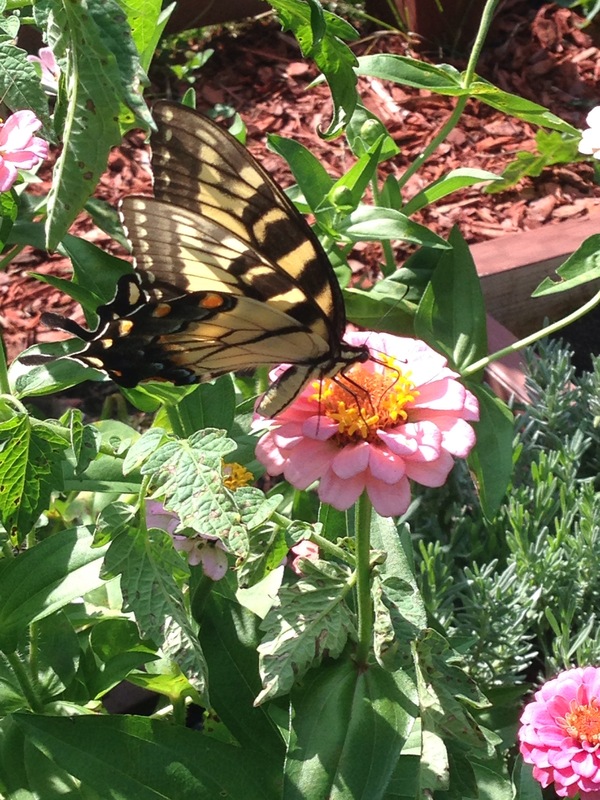 One of the reasons is because my Zinnias are in full bloom and these beautiful ladies show up to keep me company! It is not until about mid July beginning of August that I spot these gorgeous creatures showing off their beautiful wings in my garden. 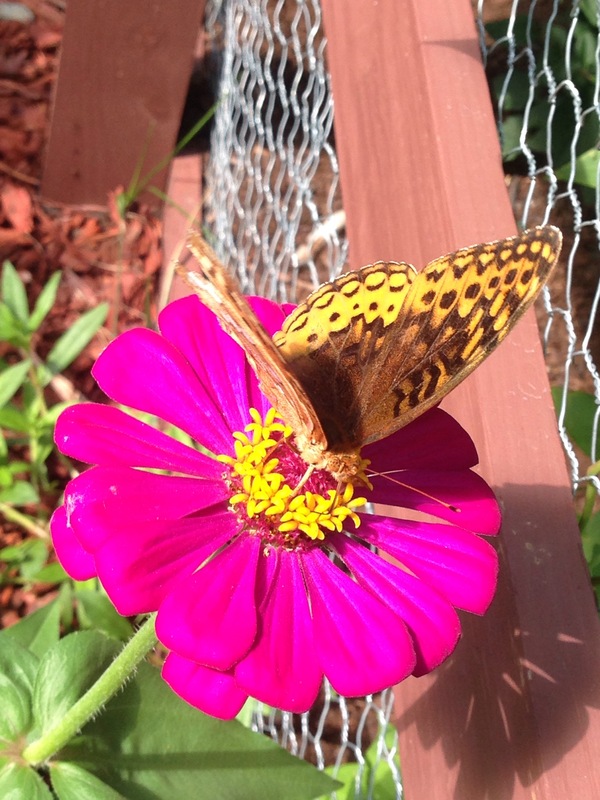 Each Spring I make sure to plant my Zinnias so these butterflies come to visit! I had to share with y’all the beauty my zinnias offer me! 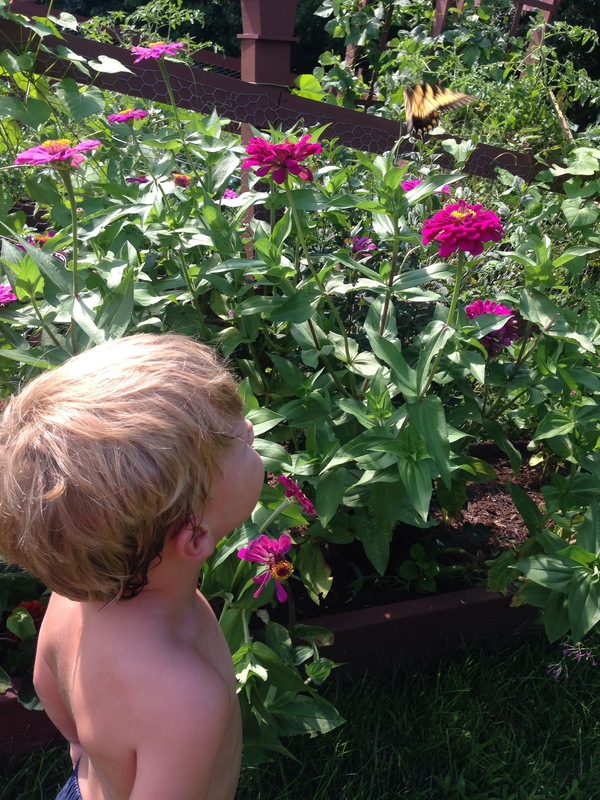 Zinnias are a MUST in the garden. 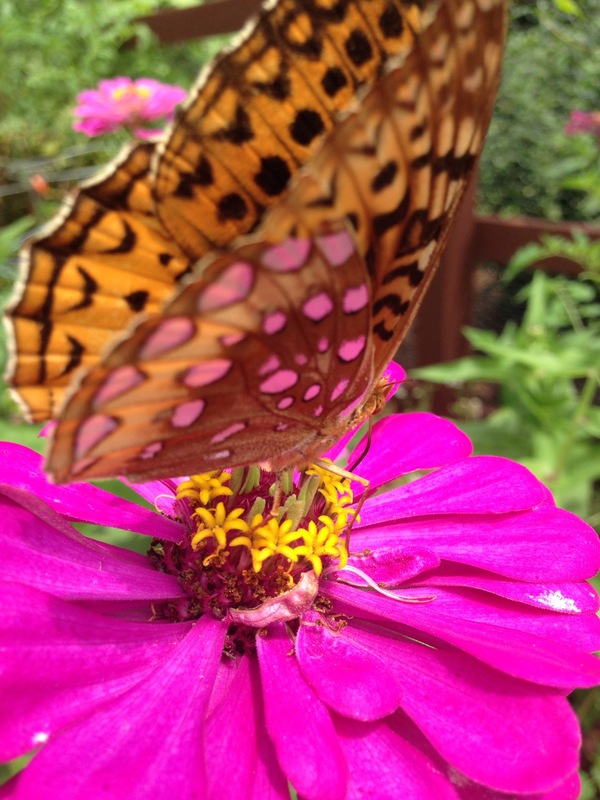 They are super simple to grow, very low maintenance and attract these winged lovelies! They contribute great pops of bright color threw out your garden, standing out against that lush green foliage on your crops and did I mention they bring beautiful garden friends! Oh, I did. 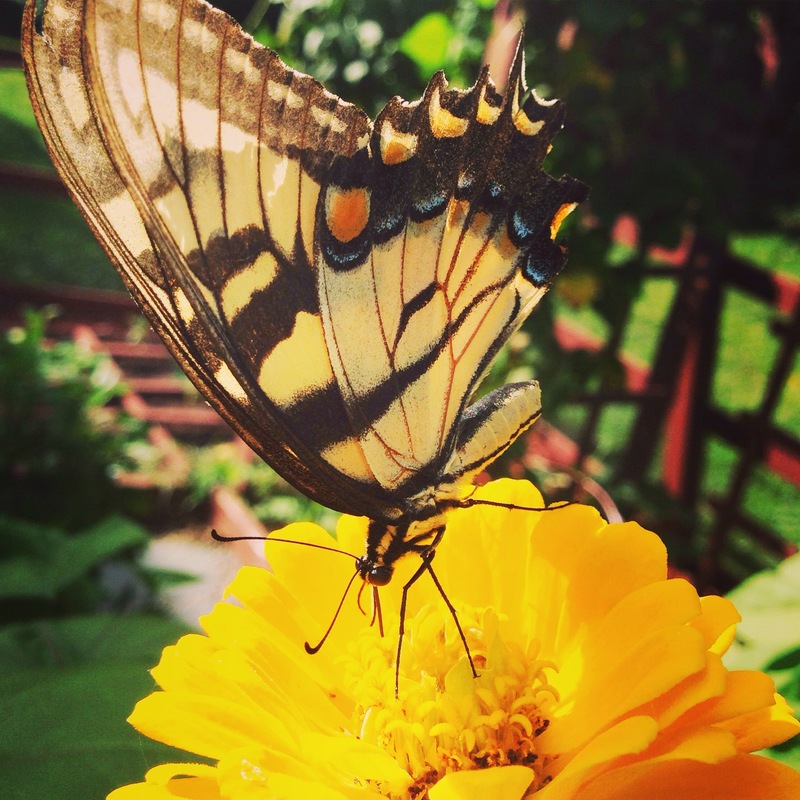 Sorry I just find the butterflies so captivating! 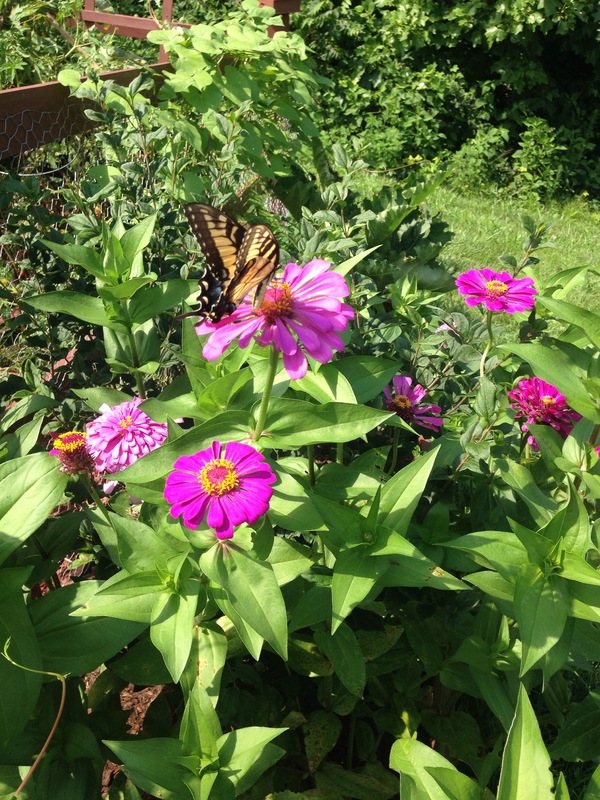 I just love seeing butterflies in my garden while I am out there working, enjoying what I had sown months before. For me zinnias also represent something more than just a pretty flower. When I first started gardening I was talking to my Mom about the flowers I had chosen to grow and she proceeded to tell me my late Grandma grew Zinnias in her garden as well and they were a favorite of hers. My Grand mother passed when I was only two, I really don’t recall any memories of her. I know my Grandma Betty was an amazing gardener and fed a family of six kids with home-grown produce from her garden! I know she grew, canned and cooked and that was her passion. I know she had grace, a certain lightness and comfort she brought to any situation that people felt and noticed. I know she brought much joy and bliss to many people’s lives. 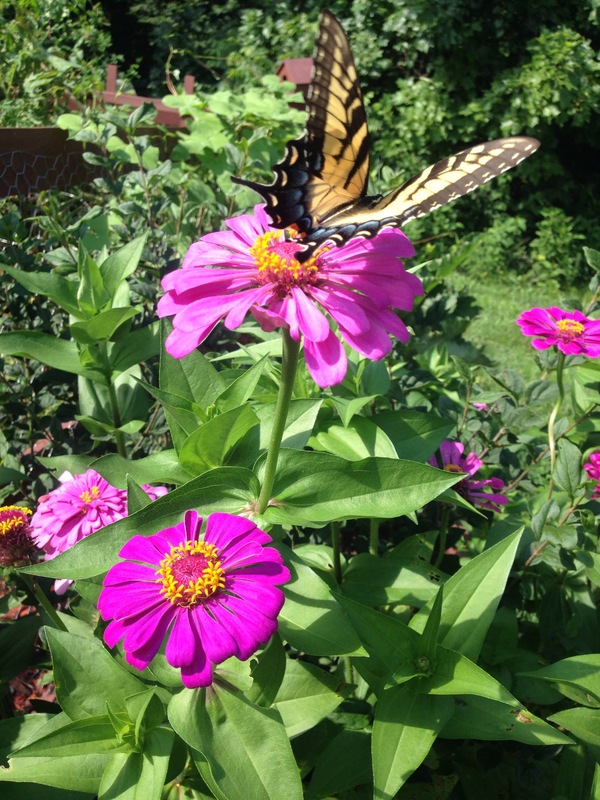 The butterfly is known for being the spirit animal and when I see a butterfly in my garden embracing my Zinnias, I like to think it is a piece of my Grandma Betty stopping in to say hello and admire the garden. One place that her and I would clearly share a connection. What I wouldn’t give to know her better, to be able to spend more time with her, to make memories together doing something that we both shared a passion for. 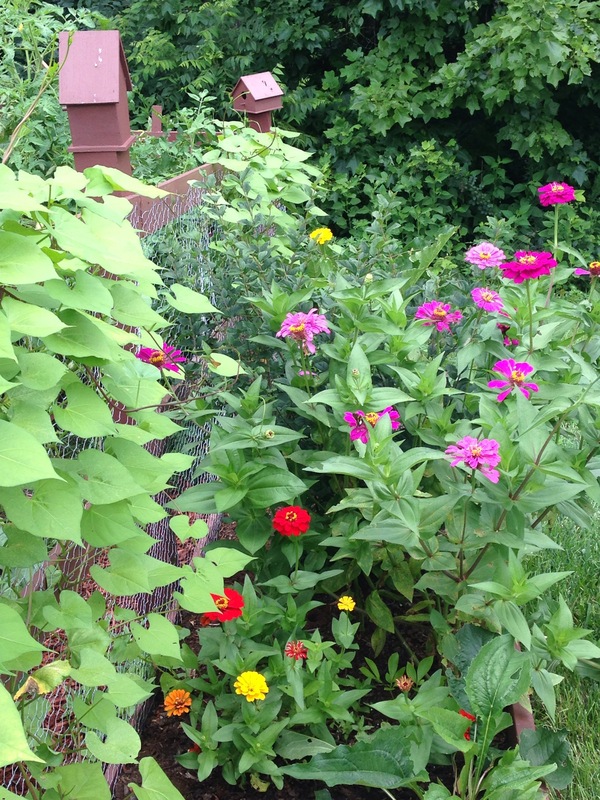 Each year I plant my Zinnias in late March or early April. When all signs of the last frost are gone. 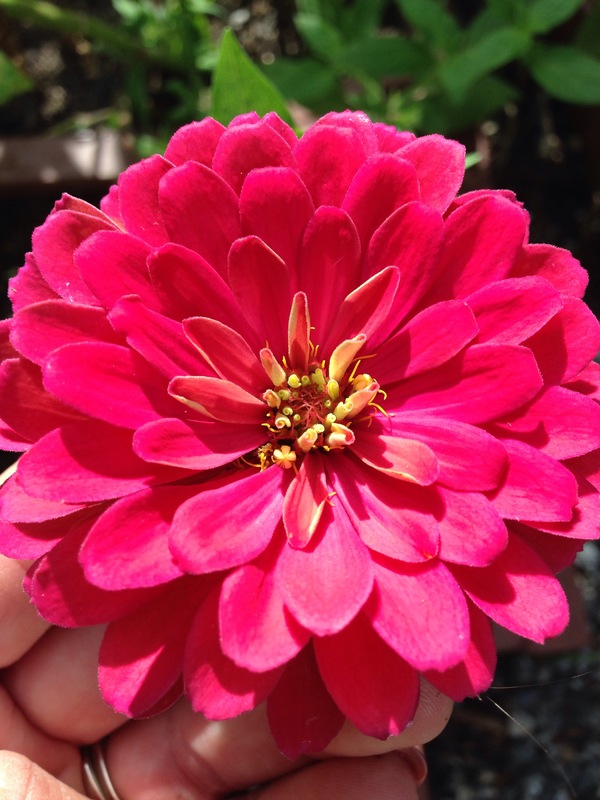 Zinnias come in many different colors. They are a simple annuals to grow. Blooming beautiful bright pom-pom blooms in the summer. They grow quickly and bloom heavily. 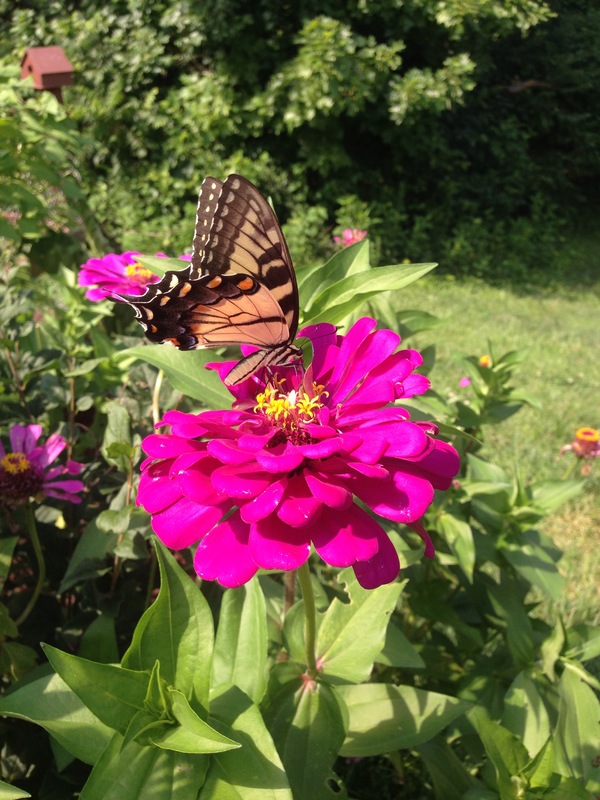 I recommend planting your Zinnias from seeds. They prefer not to be transplanted and are super simple to start from seed. They require full sun, 6 hours plus. I simply sow “about” eight seeds per square foot making eight holes about 1/4 inch deep and dropping about three seed per hole, cover with a little dirt and water. They take about 5-10 days to germinate and I thin when they reach a few inches tall. They take about 35-60 days to bloom and I remove the faded blooms to allow for more buds. Your typical varieties usually grow to be about 3 feet tall but they do have miniature zinnias that only get to be about a foot tall. 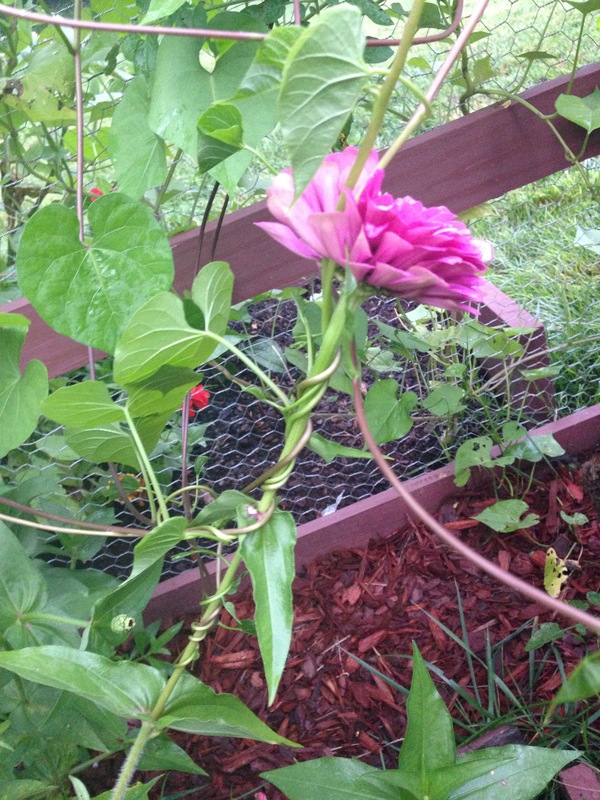 I have grown both and prefer the 3 foot varieties because they have bigger blooms. Some of my favorite varieties are Giant Lavender Gem and Giant Scarlett Flame. 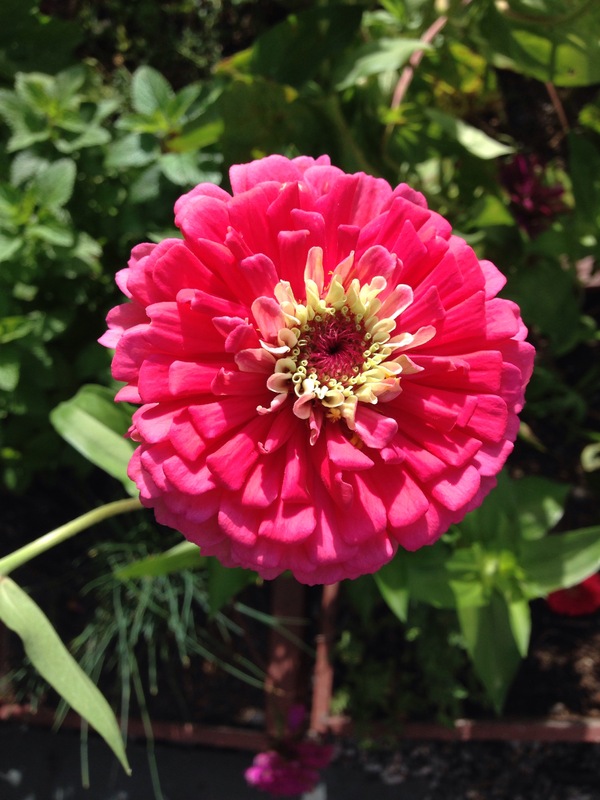 Zinnias make wonderful fresh-cut flowers to display in your home or as a gift. My fresh-cut Zinnias last about a week in a vase with fresh cool water, a tbsp of white vinegar and tbsp of granulated sugar. Be sure to change your water everyday to achieve the longest life span. 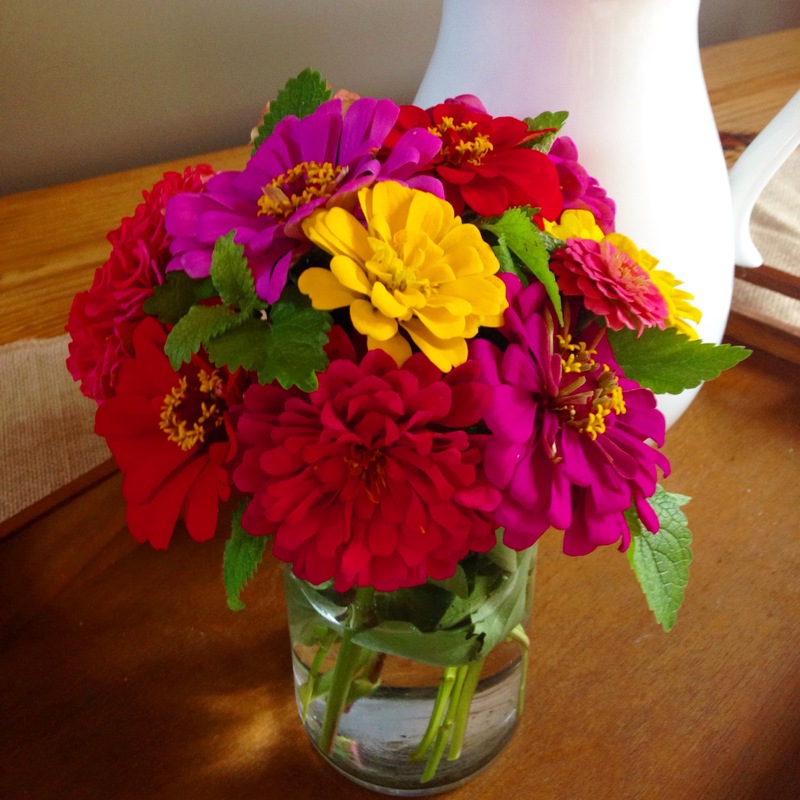 I enjoy using my Zinnias for floral arrangements. Look how pretty! An if your lucky your Zinnias might bring the brilliantly bright golden finch to your garden. A pleasant surprise when you spot them! I spotted my first golden finch last summer and was in awe of the birds vivid coloring and unfortunately I found out that they were the culprits plucking my pedals off my Zinnias! They do this because they are looking for the seeds to eat in the flower. At first I was really annoyed but I did some more reading and found out that birds are beneficial in the garden, helping to keep the bad bug population down. So this year I brought two bird houses into the garden and planted double the Zinnias! It’s a golden finches paradise! I thoroughly enjoy these garden lovelies and they give me a feeling of calm and peacefulness! When you have a garden you quickly learn to embrace nature and all it has to offer. Grow it. Pick it. Enjoy it.